Friend/reader Brie tipped me off about this year’s turkey cake… uh, is it a craze? Or is it just an idea? Are people really making cakes out of their leftovers? 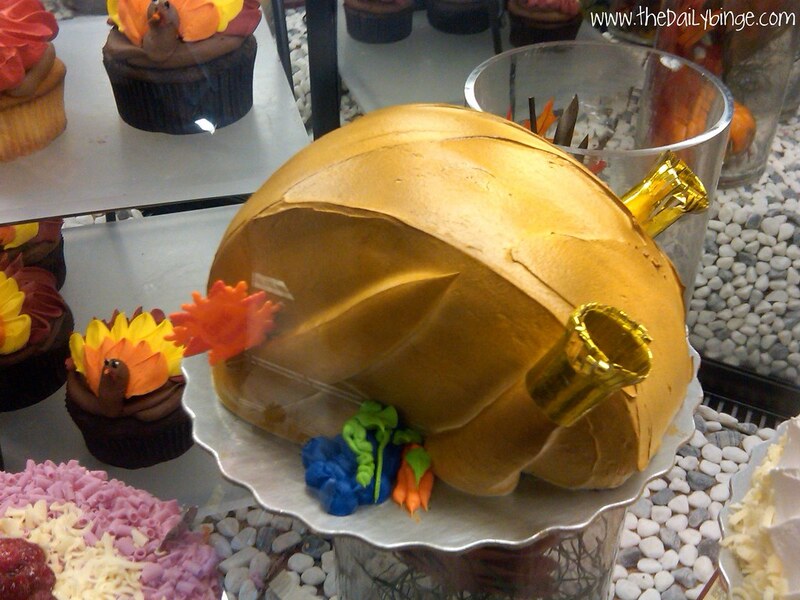 While foodies are making turkey into cake, cake-makers are making cakes into turkeys. I discovered these sweet– and slightly odd– renditions at Ralph’s yesterday. Does it have white meat and dark meat? 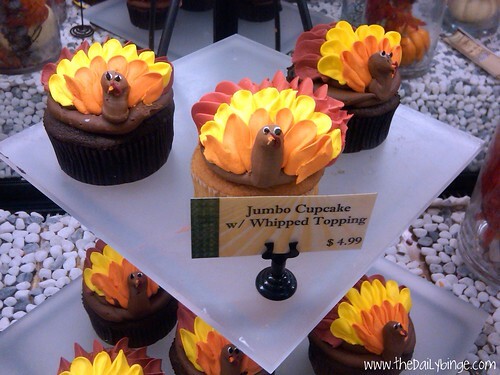 I’m sorry, but Thanksgiving is not a day for cake, turkey-shaped or otherwise. It’s a day for pie– pumpkin, apple, pecan, etc. As far as the actual-turkey turkey cake goes, I’m not opposed to eating every element of the dinner in one bite. In fact, I tend to try to pile everything on my fork at once. Somehow Thanksgiving foods taste good all mingled together. Maybe I would get on the turkey cake bandwagon if the turkey was sliced and not ground. (I like ground turkey, but it’s not Thanksgiving-esque.) And if I didn’t already have a plan for my leftovers. In my family we eat a 2nd-day leftovers feast (basically Thanksgiving part two), and tomorrow we will boil the turkey’s carcass, add parsnips, barley, carrots, Manischewitz soup mix, and… some other stuff… and make a delicious hearty turkey barley soup. How do you utilize your leftovers?